Your odyssey to epic riches begins in the incredible Treasures of Troy slot machine from IGT. Enjoy unprecedented levels of slot action with 40 paylines plus 1024 additional ways to win! Bet 40 coins to activate 40 paylines; gain 1024 more ways to win for only 40 coins more. With twenty independent reels, you can reap monumental pays for big clusters of matching symbols. Your odyssey to epic riches begins in the incredible Treasures of Troy slot machine from IGT. Enjoy unprecedented levels of slot action with 40 paylines plus 1024 additional ways to win! Bet 40 coins to activate 40 paylines; gain 1024 more ways to win for only 40 coins more. With twenty independent reels, you can reap monumental pays for big clusters of matching symbols. 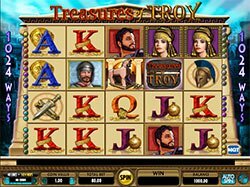 This slot is based on the epic battle from the Trojan War in the Bronze Age between the kingdoms of Troy and Mycenaean Greece. Multiway Game – Multiway is IGT’s branded way of saying the slot has 1024 ways that you can win. This is a deviation from standard ‘line’ slots where fixed paylines are sort of elimited giving you more winning possibilities. Another way of looking at it is that you have 1024 paylines, although instead of paylines, they are just the number of possible combinations you can make. Treasures of Troy Wilds – The game’s logo is the Wild symbol and will substitute for most symbols except the scatters, to complete winning combinations when possible. The wild can appear in reels 2, 3, 4 and 5 only. Treasures of Troy Free Spins – Hit three Trojan Horse scatter symbols to be awarded the Treasures of Troy free spin bonus. During the Free Spins Bonus, you can re-trigger the Bonus multiple times. Your Free Spins Bonus continues until you have 0 spins remaining, or until you have played 130 free spins, or until the maximum award is reached. To re-trigger the Bonus, you need to get two or more Bonus symbols on any of the center column reels on a Free Spin.